This week I am attending the Biennial Conference on Chemical Education. it is the first chemistry conference I have ever attended, and I admit to being a little nervous as I arrived. I felt a little like a secret agent dispatched to a foreign land. It seemed like only a matter of time before my secret identity was discovered and they would throw me out for knowing so little about chemistry. Perhaps I could negotiate for a bit of geology knowledge and a whole lot about open access and scholarly communication. So far, I’ve either hid my real identity well or these chemists are as welcoming as everyone said. On Sunday afternoon I was able to attend a few talks about the use of electronic lab notebooks, and a few talks about undergraduate research. Many of the faculty at my institution face challenges dealing with student research data. With more frequent turnover than their colleagues at graduate schools, keeping track of data from so many sources can be challenging. On Sunday night I attended the plenary talk from the president of the ACS himself, Bassam Z. Shakhashiri (see this website, too). Apparently dubbed the “Dean of lecture demonstrations” by Encyclopedia Britannica, Shakhashiri was engaging, humorous and inspirational. His talk was also frustrating. At several times he talked about how the mission of the ACS was to “Advance the broader chemistry enterprise and its practitioners for the benefit of Earth and its people” and he expanding on this saying “especially in the face of denial of basic human rights especially the right to benefit from scientific and technical progress through access to the advances of science” (emphasis was his). He talked about the social contract of science, that taxpayers who pay for the research should be able to learn about the results. I agree! But I think we disagree on how taxpayers should learn about those results. I believe Shakhashiri was talking primarily about science education and science writing. He discussed an interesting initiative to get PhD candidates to include a chapter in their dissertation explaining their research to a lay audience. But I couldn’t help but feel something was missing, given the ACS position on things such as access to taxpayer funded research, open access, and their incredibly aggressive institutional subscription price increases. Towards the end of the lecture, Shakhashiri impressed everyone by a few simple chemical demonstrations. The 1000mL graduated cylinders of purple, pink and blue liquids peaked my interest from the time I sat down, and the addition of dry ice just made things more interesting. Importantly, he forced the audience to be explicit about our observations of his demonstration – it wasn’t just about the wow factor, but walking the audience through observations about what was happening. So far, my sojourn into unknown territory has been highly educational. I anticipate that the sessions of the next couple of days will help me learn a bit about chemistry education, a bit about chemists, and perhaps even a bit about chemistry. This afternoon I will be standing in front of my poster at the Geological Society of America Annual Meeting: “Fueling Learning Outside the Classroom with Strategic Searching of the Geoscience Literature”. Stop by if you are in the area. In this poster, we are presenting a plan for information literacy instruction in mid-level geology courses and including some concrete ideas for how geology professors can include some of these strategies in their classes whether or not they have a science librarian available to collaborate with. A handout we were giving away with suggestions for incorporating these ideas into classes and sample literature assignments. Every three years, my alma mater, St. Lawrence University, hosts a unique conference experience for its current and former geology majors. Alumni return to campus while classes are in session to present research related talks, discuss career paths and network with current geology students. I had an opportunity to attend one of these conferences when I was an undergraduate. The ability to chat with recent grads about the realities of graduate school was incredibly useful. The opportunity to see what kinds of careers the alumni had pursued was helpful for me to answer that ever present question – what exactly can you do with a degree in geology? As an alumna, I have a great opportunity to talk to current undergraduates about the opportunities available in librarianship/information science. I also have a chance to catch up with some friends from college. The variety of talks from practicing professional geologists. Although academic presentations still outnumbered the more practical ones, the talks given by professional geologists were engaging, interesting and very informative (perhaps more so than the academic presentations?). I think they were very helpful for the students. Giant chocolate chip cookies from the “Pub”, one of the on campus eating establishments. A chance to chat briefly with the new president of the University who wrote an excellent article describing libraries as “the most dangerous building on campus“. Intellectual chain reactions exist in an air of danger, daring and human hazard; transforming elements of thought require the chase, the hunt, and the adventure of traversing narrow cliff-side paths and box canyons. Talking to a former classmate whose old nickname was based on the beer he drank about potty training and the challenges of having a newborn baby at home. The opportunity to chat with old friends and current students. Seeing my friends is great, but it is wonderful to chat with highly intelligent and motivated young people about what they want to be when they grow up. And I love giving advice, so that is fun too. This unique conference will happen again in 2013, and I’m already looking forward to it. The SUNY Librarians Association Conference was last week, but only now do I have a chance to write about what I got out of the conference. Like most SUNYLA conferences, there was a lot of useful stuff and just a few sessions that didn’t really add to my knowledge or provide me with any ideas. I gave a presentation with two of my colleagues about strategies to reach out to faculty (slides and speaker notes are here) and the conversations afterward (in the session and on the way to lunch) provided a real glimpse at what SUNY libraries are doing, and other possible strategies that we could use. For example, several libraries provide new faculty with a pot of money to buy books from the library. The library liaison is responsible for helping the new faculty member spend their money, which provides a great opportunity for the faculty members and the liaison to get to know one another. Other libraries made it a point of taking new faculty out for coffee, in order to share with them some information about the library, and to determine what their needs might be. Another library actually provided a competitive grant for established faculty to get a small pot of money to purchase books to support new research directions. Another excellent presentation was given by Suzanne Bell from the University of Rochester about her institution’s home grown institutional repository, called IR+ (open source, code available here). One of the things that makes this repository unique is the not visible to the public workspace provided to each faculty member. This repository doesn’t just serve as a final resting place for documents, but it provides researchers with sharing and version control services, allowing them to collaborate with other researchers (at U of R and other places) more easily. I really like how this tool attempts to get into the researchers workflow much earlier in the process, rather than just accepting the final output, like most IRs. This presentation sparked an excellent conversation with some of my colleagues at Geneseo about the possibilities for us to support faculty research, including some of the practical steps we need to take in order to do this. The last session I attended was a presentation from two librarians about how to do a systemmatic review, a type of review article (kind of) that I was not very familiar with. They gave a clear explanation of the process. I wish there had been more time for questions but it was interesting. Once again, a satisfying conference. I look forward to next year. Today and tomorrow I am attending the SUNY Librarians Association Annual Conference, held at SUNY Brockport. SUNYLA (as it’s known) is one of my favorite conferences, despite my recent call for librarians to stop going to library conference. First, I get to find out about lots of exciting things that are happening at SUNY Libraries. We are a pretty smart group of people, and I can learn a lot from my colleagues. As a plus, the group is dominated by librarians from 2 and 4 year colleges, so the activities that are being presented almost always seem manageable. Second, I get to see old friends and make new friends from the other campuses. I find it much easier to meet people at a small conference like this than at the larger ALA or SLA conferences. Third, it’s a great place to make a presentation to a forgiving audience. Sometimes I’d like to share information with colleagues, but I don’t feel that what I’m doing is new and unique enough to warrant a major presentation or paper. The SUNYLA conference is great for this kind of thing. Plus I get more experience presenting. This year I’ll give a small presentation about strategies for reaching out to faculty, and a larger presentation about using assessment to evaluate information literacy goals. Scholarly Communication: What can my library do right now? In January, 2010, my library formed a Scholarly Communication Group, of which I am a member. One of our first activities was to honor a recent faculty publication (Broadway : an encyclopedia of theater and American culture by Thomas Allen Greenfield) that involved many campus authors. After this celebration, we have struggled a bit to find our role at this small liberal arts college. In search of a well defined purpose for our group, I attended the recent Spring Conference of the Western New York and Ontario chapter of the Association of College and Research Libraries (WNY-O ACRL). The conference theme was “Getting the Word Out: Scholarly Communication and Academic Libraries.” I was hoping to get some ideas of things that we could do NOW, and to look at how we might be able to grow our scholarly communication efforts over time. I wasn’t disappointed. We can help faculty interpret their publishing contracts, suggesting the SPARC author addendum when appropriate. We can do the research and legwork to help faculty find a good journal to publish something new in. They are probably already familiar with journals in their primary research area, but if their interests lead them in new directions, we may be able to help find a publication venue that meets their needs. We can recommend tools and programs to help scholars manage digital information. Bookmarking from Delicious, Connotea or Diigo. PDF and reference management with Zotero or Mendeley (among others). Customizing research databases like Scopus. And lots more. What do I want our library do in the future? Develop an institutional repository for undergraduate presentations, faculty publications, conference posters and presentations and anything else that folks want to put in it. We need to set up a repository, figure out how we will manage it, and what we want in it. Work with faculty to develop plans and strategies for managing their research data (especially now that NSF grant applicants may be asked for a “Data Management Plan”). We need to learn about data management. I suspect that many of our current skills will transfer nicely, but I need to learn a bit about it. Present faculty colloquia about scholarly communication issues. I think we are getting started on this. The conference sessions also gave me some important insight about how to discuss scholarly communication issues with faculty and administrators. Austin Booth and Charles Lyons from the University of Buffalo presented the results of some surveys and discussions they’ve done with faculty to gauge faculty interest and knowledge of scholarly communication issues. The short story is that (no surprise) faculty aren’t particularly interested in the serials crisis. They are interested in their own publishing opportunities. As a result, the question of open access (either gold or green via institutional repositories) may best be framed in terms of the impact on faculty publication. Although there is still some debate, the studies evaluating the impact of open access seem to point to an increase in citations to articles that are freely available. Although it was brief (just one day) and small (no more than 50 participants) it was an excellent conference that gave me a lot of ideas for the future of scholarly communications in our library. 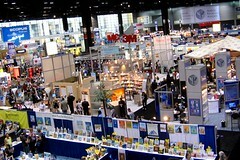 The vendors at the ALA conference, "The Stacks". From flickr.com user Squid! And start going to the conferences our users – especially the faculty we work with – go to. OK, we don’t have to completely stop going to library conferences, but unless we engage with our users more fully, I think we run the risk of being forgotten. At the ScienceOnline2010 conference, two librarians held a session attempting to tell scientists and researchers about library tools that were available. The ensuing discussion between librarians and scientists solidified some ideas that I’ve been having for a while now about the library world. Overall, there was a disconnect between the library world and the research world. Scientists and scholars aren’t aware of what librarians do, beyond the whole ‘buying books’ thing. And I don’t think that librarians are spending enough time listening to scientists and scholars to figure out what they really need and want. After reading about this discussion online, a medical researcher responded in a blog post with a rather provocative title about what he thinks librarians can do for researchers. Librarians – we need to listen to what the researchers are saying, and we need to play an active role in the discussion. As a profession, I think we are more insular than we should be. This needs to change. That’s why we need to start attending the same conferences as the scholars we serve. By engaging more fully with our users, we will better understand their needs (perhaps even anticipate some of them), and the library conferences we do attend will be more useful. So, to that end, even though the freebies are more plentiful, I will not be attending the ALA annual conference this summer. Hopefully, I will head to Denver for the Geological Society of America national meeting in October. And perhaps the year after that I will make it to the American Chemical Society conference.